Last week some friends and I had supper at the Cube Tasting Kitchen. I should emphasise at the outset that for all the fact that I write a blog about food, I’m not a huge fan of the mad flights of fancy which characterise fine dining at the moment. I’m not into molecular gastronomy. I think it’s really interesting—and for a number of reasons, not only culinary—but given the choice between that and the sublime comfort food served at The Leopard and Woodlands Eatery, pizza at Stella e Luna, or dim sum at the South China Dim Sum Bar, I’d probably choose one of the latter. But Cube was, really, entirely wonderful. And fun. It’s a small, box shaped, white walled restaurant in Joburg’s Parktown North, in a row of good and unpretentious middle-range restaurants, including Mantra which is one of my favourite places at which to eat saag paneer. It was an evening of delights over fifteen courses. We began with six starters, each themed according to a vegetable—tomato, cucumber, cabbage, potato—or a deconstructed—pissaladière—or reconstructed—Parmesan ice cream with balsamic vinegar made to look like vanilla ice cream and chocolate sauce—version of a familiar dish. 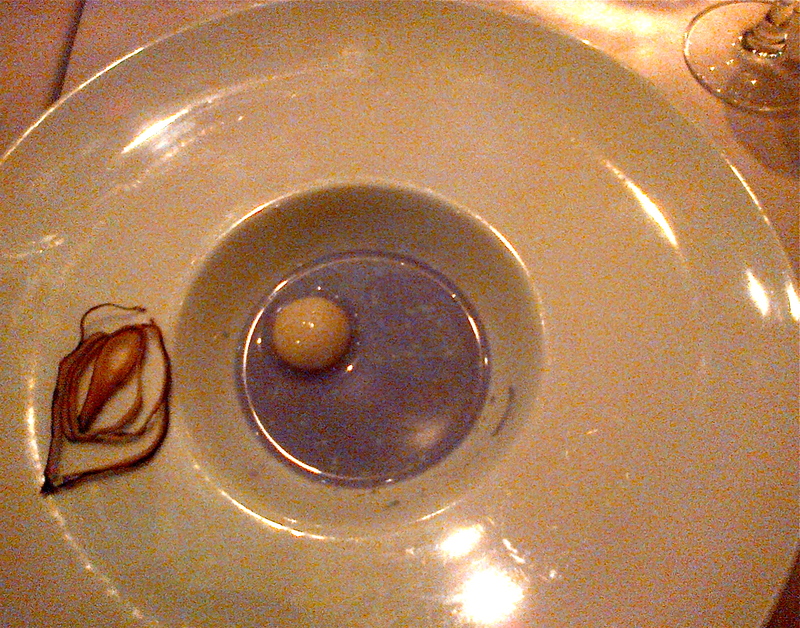 The cucumber came with a gin cocktail, the cabbage soup was blue and then turned purple, and the Parmesan ice cream didn’t really work. That was okay, though. The fact that not every course was an absolute success was part of the fun. The infectious enthusiasm of the young chefs—who cook almost in the middle of the restaurant—and of the serving staff turned this into a game and an adventure. I had vegetarian main courses. The oddest, but most successful, was a combination of asparagus, humus, and shards of meringue with black pepper. The most delicious was a mushroom soufflé and a curry reduced to its most basic elements. 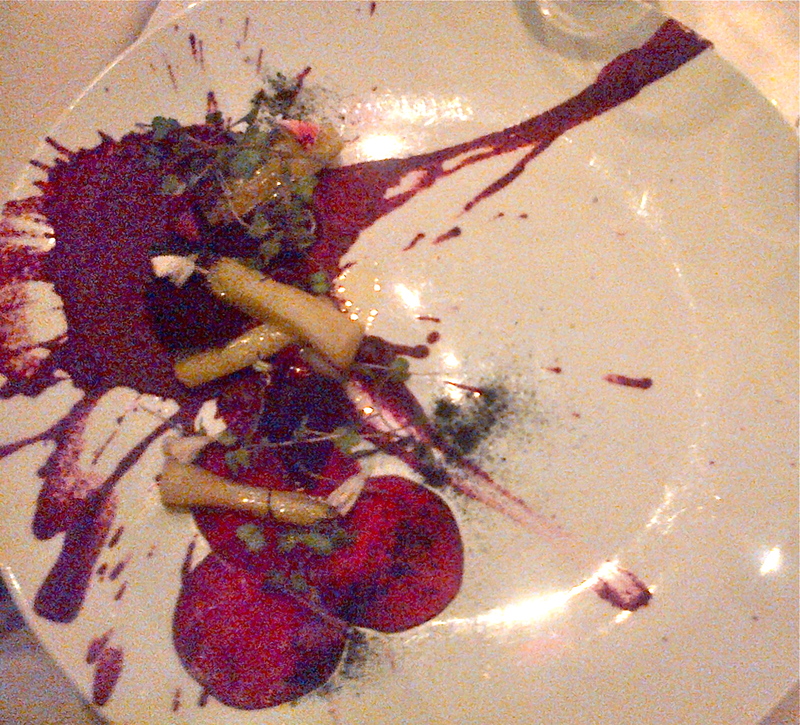 The most beautiful was a Jackson Pollocked plate of beetroot and leek, which was also, paradoxically, the least flavourful. And pudding—after baklava and cheese, and a palate cleanser of sherbet, pomegranate jelly, and orange sponge consumed as you would tequila with salt and lime—was a forest floor of pistachio marshmallow, rice crispy and cranberry cookies, chilled chocolate mousse, dried flower and chocolate soil, coffee biscuits, lemon gel, and wheat grass. Then there were chocolate brownies and coconut ice. The size of the portions and the length of time it took to eat all of this—we were there for more than three hours—meant that we could digest at leisure. Because this was as much an intellectual and sensory exercise as it was supper. It would be easy to criticise this kind of dining on the grounds that its purpose is not really to feed people: it uses good, expensive food to allow fairly wealthy paying customers to have fun. But it is equally true that food has always been about more than nutrition. Human beings have long consumed—sacrificed—food in the name of status and power, in performing rituals, and marking celebrations. It is, though, interesting that molecular gastronomy—which has its roots in the nouvelle cuisine of the 1980s—came to prominence before and during the 2008 crash, in a period marked by ever widening social and economic inequality. (On a side note, it’s worth thinking about relative definitions of wealth: our meal at Cube was expensive, but within the realms of financial possibility even for someone on a fairly modest researcher’s salary. I would never be able to afford the same menu at a similar restaurant in London, for instance.) 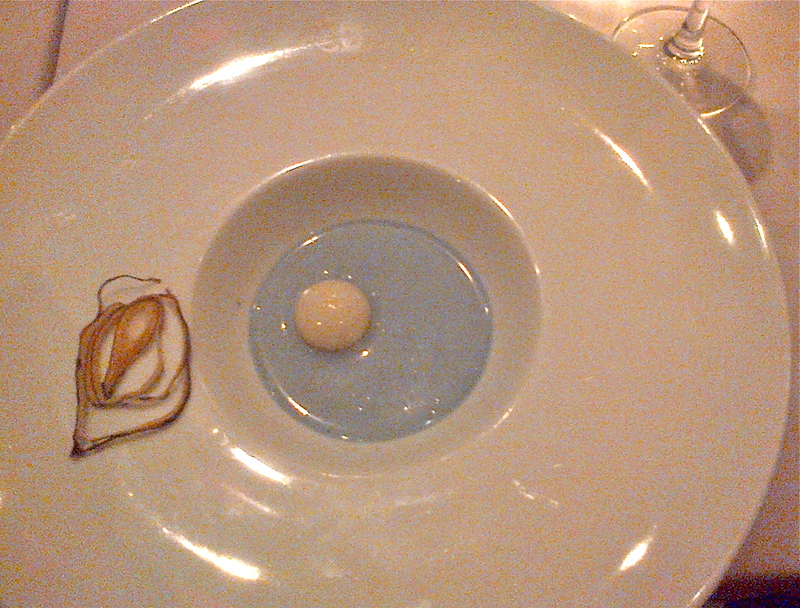 Molecular gastronomy does not—despite the grandiose claims of some of its practitioners—represent the future of food. This work, though, does not really fundamentally challenge our eating habits and choice of things to eat. Noma might serve insects and Blumenthal may have invented snail porridge, but molluscs and insects have been part of human diets for a very long time. I think that a more accurate name for molecular gastronomy is, really, modernist cuisine—the title of Nathan Myhrvold’s 2011 encyclopaedic guide to contemporary cooking. In all of is reliance and enthusiasm for technology, molecular gastronomy is supremely modern: this is the food of industrialisation. It is as heavily processed as cheese strings. Modernist cuisine is the logical extreme of an industrialised food system. That’s one long sitting for a meal I must say!!! Well, it did involve fifteen courses. And we were really enjoying ourselves. I’m not really into eating mollecular and like you gravitate to more traditional and comforting foods. However, I did experience it at a high level the other night and the distillation of the flavours was unbelievable. I’m so over the deconstructed craze – it’s ingredients isn’t it?!! Interesting point about this sort of cuisine being the ultimate expression of an industrialised food system – I never thought of it that way. I agree – this kind of cooking can be fascinating and delicious in a way that engages both the senses and the intellect. But to suggest that it represents the future of food? I’m not so sure. I mean, as you say, why embrace Heston’s mince pies with all their weird ingredients and then scorn cheese strings for much the same reason?